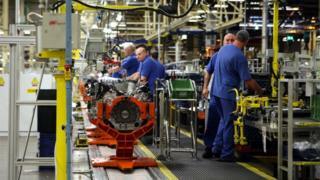 The Unite union has urged Ford to convert its UK engine plants to making electric cars and battery technology. Currently Ford makes engines for the Ford Fiesta and Jaguar Land Rover vehicles at Bridgend in South Wales and diesel engines in Dagenham in Essex. Both plants faces uncertainty, as Jaguar plans to build its own engines and demand for diesel cars has plunged. Unite wants to secure the future of both plants by persuading Ford to switch them to electric vehicles. "These sites must be repurposed for new electric models or battery technology," Unite said. On Wednesday the union will present a document outlining a strategy for the whole UK automotive industry, which it says supports 800,000 jobs. Have diesels been getting a bad press? It will ask the government to help the shift to electric vehicles by supporting research and development, training and investment. Production of engines for Jaguar Land Rover at the Ford Engine plant in Bridgend will end in September 2020. Half of the workforce of 1,930 at Bridgend works on that engine. At the moment Ford Bridgend makes half a million engines a year for Ford's own models and a quarter of a million for JLR. Meanwhile a cloud hangs over Dagenham as demand for cars with diesel engines has fallen. Figures from industry body the Society of Motor Manufacturers and Traders showed sales of new diesel cars fell 17.1% last year as higher taxes and pollution fears hit demand. A recent study by Aston University forecast a further 10% drop in sales this year and estimated that diesel cars will account for less than a third of the market by 2020.